celebrities and athletes alike were in Austin to inspire. The Cranberries are singing on the radio: Understand, what I’ve become, it wasn’t my design. And people everywhere think something better than I am. To the people I’m riding with, the name Armstrong means courage, self-will against all odds, even a kind of unshakable positive attitude. 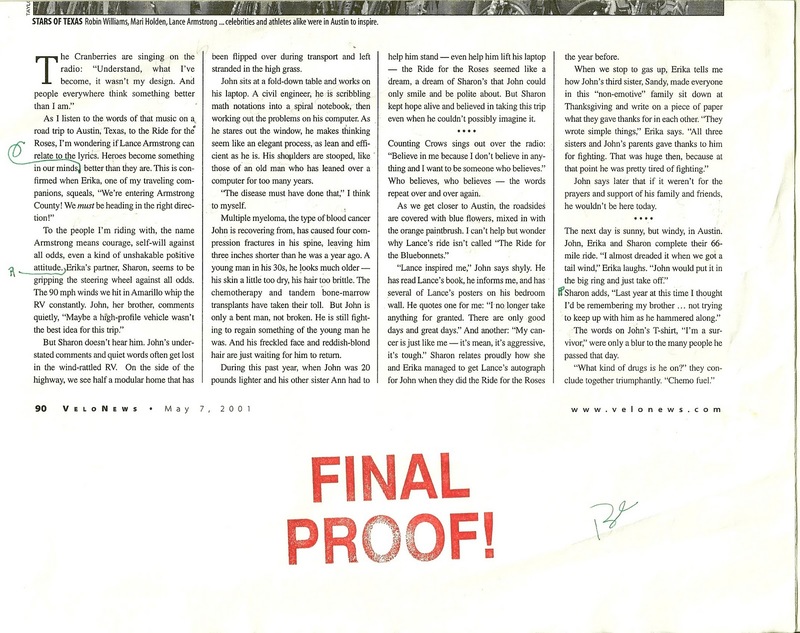 Final page proof of article I wrote for VeloNews in 2001. But Sharon doesn’t hear him. John’s understated comments and quiet words often get lost in the wind-ratted RV. On the side of the highway, we see half of a modular home that has been flipped over during transport and left stranded in the high grass. John sits at a fold-down table and works on his laptop. A civil engineer, he is scribbling math notations into a spiral notebook, then working out the problems on a computer. As he stares out the window, he makes thinking some like an elegant process, as lean and efficient as he is. His shoulders are stooped, like those of an old man who has leaned over a computer for too many years. The disease must have done that, I think to myself. Multiple myeloma, the type of blood cancer John is recovering from, has caused four compression fractures in his spine, leaving him three inches shorter than he was a year ago. A young man in his 30s, he looks much older — his skin a little too dry, his hair too brittle. The chemotherapy and tandem bone-marrow transplants have taken their toll. But John is only a bent man, not broken. He is still fighting to regain something of the young man he was. His freckled face and reddish-blond hair are just waiting for him to return. During this past year, when John was 20 pounds lighter and his other sister Ann had to help him stand — even help him lift his laptop — the Ride for the Roses seemed like a dream, a dream of Sharon’s that John could only smile and be polite about. But Sharon kept hope alive and believed in taking this trip even when he couldn’t possible imagine it. Counting Crows sings out over the radio: “Believe in me because I don’t believe in anything and I want to be someone who believes.” Who believes, who believes — the words repeat over and over again. 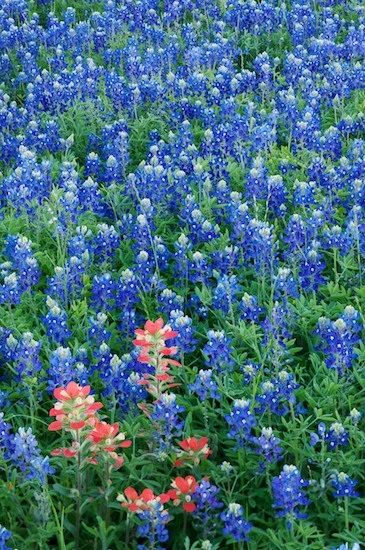 As we get closer to Austin, the roadsides are covered with blue flowers, mixed in with the orange paintbrush. I can’t help but wonder why Lance’s ride isn’t called The Ride for the Bluebonnets. “Lance inspired me,” John says shyly. He has read Lance’s book, he informs me, and has several of Lance’s posters on his bedroom wall. He quotes one for me: “I no longer take anything for granted. There are only good days and great days.” And another: “My cancer is just like me — it’s mean, it’s aggressive, it’s tough.” Sharon relates proudly how she and Erika managed to get Lance’s autograph for John when they did the Ride for the Roses the year before. John says later that if it weren’t for the prayers and support of his family and friends, he wouldn’t be here today.